A talented jumper and Triple Jump specialist. 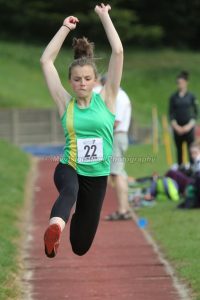 Lucy started competing for the club in 2014 as an U15 athlete when she split her attention between hurdles, Long Jump and sprinting. In 2015 she discovered Triple Jump, but didn’t really start specialising until the following year. It was 2016 when she started to become a Championship performer, winning the Avon Championships and Avon Schools. The following year she progressed further, taking a bronze at the South West Schools and South West Inter Counties.